﻿ Carpet Cleaners in London From Us: A Truly Professional Service! Ours is a truly professional carpet cleaning service: it’s what we’ve done the best way possible, over the years. In fact, it comes with a Full Satisfaction Guarantee for You — or we will re-clean, free of charge! Free carpet cleaning advice: Yes, it’s free and it’s good, quality advice from our expert technicians. Anyone in London can take advantage of this offer. Free, no-obligation quote: You simply give us a ring or send us an e-mail and we’ll give you a personalised quote, based on your post code. We run regular discounts on our site so you’ll definitely get a great quote from us. Over seven years of carpet cleaning experience: It’s all laid out for your needs. Short-notice availability: All our cleaners can also be made available for you, even on short notice. Complete coverage of London: Our carpet cleaning experts cover all boroughs in London with their services. 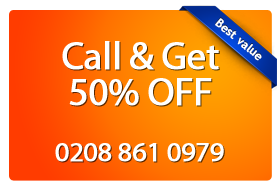 You are entitled to a generous carpet cleaning discount based on the London area you live in. More details, ring us direct on 0208 861 0979! Remember: Satisfaction is guaranteed or we re-clean for free.